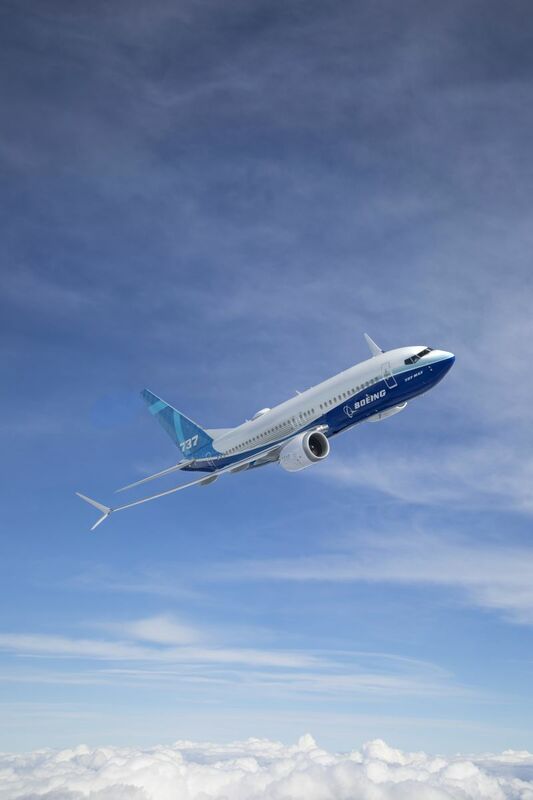 Boeing has suspended its 737 MAX aircraft worldwide based on new evidence from the site of the Ethiopia Airlines crash at the weekend. It said the decision was 'out of an abundance of caution' and expressed its sympathies to the families and loved ones of those who lost their lives in the two 'tragic accidents'. President and CEO Dennis Muilenburg added: "We are doing everything we can to understand the cause of the accidents in partneraship with the investigators, deploy safety enhancements and help ensure this does not happen again." The FAA said the new evidence, together with newly-refined satellite data available, led to its decision to ground the planes pending further examination of the jet's flight data recorders and cockpit voice recorders. Its statement on Wednesday came after a succession of US lawmakers, along with pilots and cabin crew associations, put pressure on the US air safety body to follow other countries around the world which had grounded the Boeing 737 MAX 8 jet following the disaster on Sunday. The crash at Addis Ababa was the second deadly accident involving the MAX 8 in five months. Last year, a Lion Air flight crashed in Indonesia shortly after take off. Southwest Airlines said it was grounding all 34 of its MAX 8 aircraft in line with the FAA's ruling. It said while it remained confident of its safety, it was supporting the FAA and other regulator bodies worldwide who were asking for further checks. Customers booked on 737 MAX flightd are being the given the option to cancel or rebook with no charges or fare differences within 14 days of their original dates. United Airlines issued a statement to its customers saying it would comply with the FAA's order and was grounding its 14 737 MAX 9 aircraft immediately. 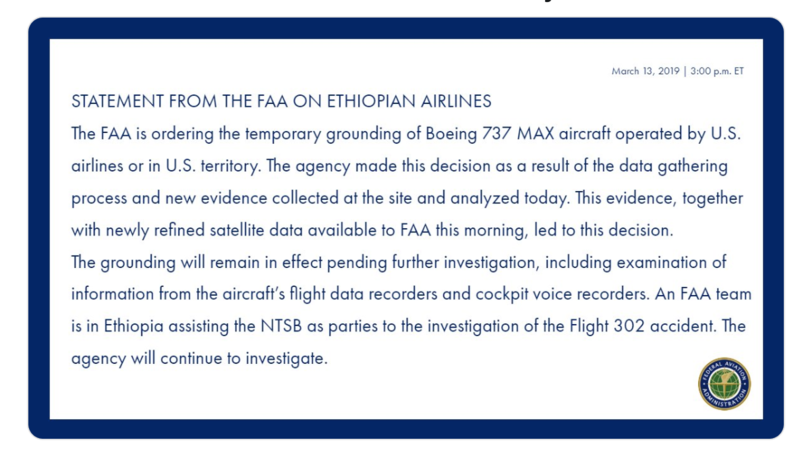 "We have been in close contact with investigators as well as Boeing to share data and fully cooperate with regulatory authorities, and will remain aligned with authorities as their investigation continues," it said. "To minimize any potential impact to customers, we have been working diligently on contingency plans to prepare our fleet in the event of a government mandate." It said the MAX aircraft account for roughly 40 flights a day. "Through a combination of repositioning other aircraft types and rebooking customers, we do not anticipate a significant operational impact as a result of this order," it said. "We will continue to work with our customers to help minimize any travel disruptions, and will proactively contact any customer whose travel may be impacted by this order." American Airlines has pulled its 24 MAX 8 aircraft from service but also said it is confident of its fleet's safety. It has flown nearly 18,000 flights on the aircraft type since taking the first delivery in September 2017.